The characters are well developed and well rounded. Most of them were people I enjoyed getting to know, but I cannot say that is true about all of them. I really did not like Cameron’s mother-in-law and her step daughter. Maybe I was not supposed to like either of them, in which case the author did a good job portraying them. All of the dogs, and their different personalities, added another layer to the book and I liked this a lot. The writing style flows smoothly and the book is a quick easy read. The author is very talented in her descriptive writing and through much of the story, I felt like I was right there, watching all the action take place. I thought the mystery was well plotted and there were enough twists and turns to keep this reader guessing. One thing that bothered me a little was the names of all the stores in the community and how they were repeated quite a bit. I felt this got tedious and distracted me from the story. This is only my opinion and most other readers may have enjoyed this a lot. 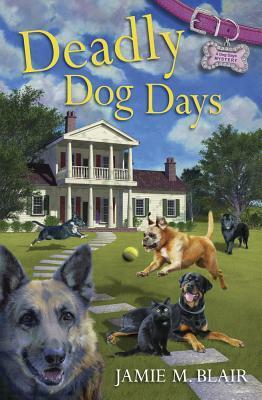 I would recommend this book to anyone who enjoys a cozy mystery with plenty of animals. I will definitely read the next book in the series when it is released. I received a free copy of this book from NetGalley in exchange for a honest review. I would like to thank NetGalley and Midnight Ink for the opportunity to read and review this book.